In the pre-dawn light of a summer morning in 1964, the 60-foot fishing trawler Ferrucio Ferri shoved off from the Italian seaport of Fano and motored south, making a steady eight knots along Italy’s east coast. When the Ferri reached the peninsula of Ancona, Romeo Pirani, the boat’s captain, set a course east-southeast, half way between the dry scirocco wind that blew up from Africa and the cooler levanti that swept across the Adriatic from Yugoslavia. The six-man crew dozed. The sea was glassy, but Pirani knew how temperamental the Adriatic could be this time of year. Just a few weeks earlier, a sudden storm had blown across the sea, sinking three boats and killing four fishermen. Weather was not his only worry. The Second World War had left its mark on the sea and made his job all the more dangerous. Nets hauled up mines and bombs left behind decades ago by retreating Nazi forces or their American pursuers. The arms of many men in Fano bore scars from the acid that oozed out of the rusting ordnance. As the sun rose, blinding their eyes, Pirani and his crew sipped moretta, a hot mixture of rum, brandy, espresso and anise, topped with a lemon rind and lots of sugar. The strong brew gave the men not just warmth, but courage. By nightfall, the Ferri had reached its destination, a spot in international waters roughly midway between Italy and Yugoslavia. The captain knew of a rocky outcropping that rose from the seabed where schools of merluza, St. Peter’s Fish and octopus gathered for safety in the summer heat. Other boats ventured farther east, into the deep waters off the Yugoslav coast, where they risked arrest for poaching, But Pirani preferred this hidden shoal. While fishing there meant occasionally snagging the nets on sharp rocks, the boat often returned to port full. The crew cast its nets into the dark waters. They fished all night, sleeping in shifts. Just after dawn, the nets tugged, catching a snag. Pirani gunned the engine and, with a jolt, the nets came free. As some peered over the side, the crew hauled in its catch: A barnacle-encrusted object that resembled a man. “E un morto!” cried one of the fishermen. A dead man! As the sea gave up its secret, it quickly became apparent that the thing was too rigid and heavy to be a man. The crew dragged it to the bow of the boat. The life-sized figure weighed about 300 pounds and had black holes for eyes and was frozen in a curious pose. Its right hand was raised to its head. Given the thickness of its encrustations, it looked as if it had been resting on the ocean floor for centuries. The men went about the immediate work of mending the torn nets. It was only later, when they stopped for a breakfast of roasted fish, that one of them grabbed a gaffe and pried off a patch of barnacles. “É oro!” he cried, pointing at the flash of brilliant yellow. It’s gold! Pirani pushed through the huddle and looked at the exposed metal. Not gold, he declared, bronze. None had ever seen anything like it. It might be worth something. The Ferri’s men made a hasty decision. Rather than turn it over to local authorities, they would sell the figure and divvy the profits. As the Ferri motored back to Fano that afternoon, word came over the radio that the town was afire with news of the discovery. The spark had come earlier, when the Captain had mentioned it while chatting ship-to-shore with his wife. Now crowds had gathered in the port for the Ferri’s return. Pirani cut the engine and waited until nightfall. By the time the Ferri pulled into port, it was nearly 3 a.m. and the docks were deserted. The crew brought the statue ashore on a handcart, hidden under a pile of nets, and took it to the house of Pirani’s cousin, who owned the boat. After a few days, the statue began to smell of rotting fish. The cousin moved it to a covered garden patio and quietly invited several local antique sellers to have a look. They offered up to one million lire, but the crew wanted more. With the statue’s stench growing stronger by the day, the cousin fretted that someone would alert police. He asked a friend with a Fiat 600 Mutipla to pick up the bronze statue and take it to a farm outside town, where they buried it in a cabbage field while they looked for a serious buyer. A month later, they found Giacomo Barbetti, an antiquarian whose wealthy family owned a cement factory in Gubbio, 50 miles inland from Fano. Barbetti said he was prepared to pay several million lire for the statue but naturally needed to see it first. When the figure emerged from the cabbage patch, Barbetti brushed aside the dirt, touched its straight nose and surmised it to be the work of Lysippus, one of the master sculptors of ancient Greece. Lysippos was the personal sculptor of Alexander the Great, and his fame as a sculptor spread throughout the ancient world on the heels of his patron’s conquests. Lysippos rewrote the canon for Greek sculpture with figures that were more slender and symmetrical than those of his predecessors Polycleitus and the great Phidias, sculptor of the Acropolis friezes. Aside from busts of Alexander, Lysippos was famous for depicting athletes, and many of his bronzes lined the pathways of Olympia, birthplace of the Olympic games. Lysippos is said to have created over 1,500 sculptures in his lifetime, but none was believed to have survived antiquity. Except, perhaps, this one. The bronze athlete in the cabbage patch may well have been one of those lining the pathways to Olympia, only to become war booty for Rome, whose glory slowly eclipsed that of Athens. As they swept through the Greek mainland and islands, Roman soldiers filled thousands of ships with plunder. 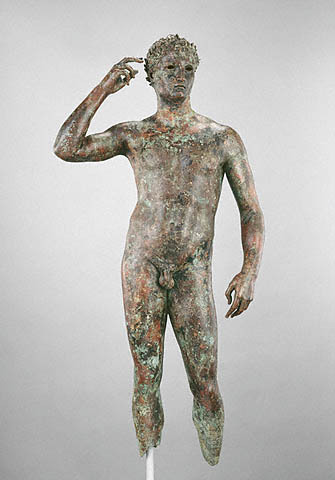 It was likely in one such raid that the bronze athlete was torn from its pedestal some 300 years after its creation and loaded on to a waiting transport ship for Rome. The Adriatic was as fickle then as it is today, whipping up deadly storms without warning. Around the time of Christ, the ship bearing the bronze athlete apparently sank to the sea floor, where it lay for two thousand years. As Barbetti touched the foul-smelling figure’s nose he clearly saw something he liked. He offered 3.5 million lire — about $4,000, enough to buy several houses in Fano at the time. The money was split among the crew. Captain Pirani’s share was about $1,600, double his monthly wages. The bronze, meanwhile, was on the move.